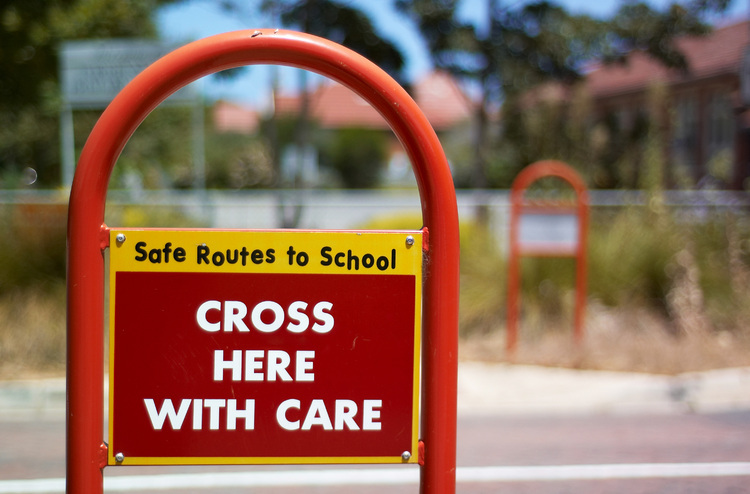 The Safe Routes to School signs outside Michael's school. Inactive for the next month-or-so as the summer holidays continue. I've tried for this shot a few times, but never quite got the effect I was looking for — this one's a lot closer — the shallow depth of field is closer to what I had been picturing. Martin, Just wanted to say how much I enjoy looking at your awesome pictures! I live in New Jersey (East coast of the USA) and it is winter and grey over here and I love looking at your pictures of flowers and sunshine. I love the colors and composition. This site is full of a wonderful photos. I'd like permission to use your image in a PowerPoint presentation with the City of Portland, Oregon, Office of Transportation. I manage the city's Safe Routes to School program. Thanks.